Games are fun. They invoke optimism and curiosity, create systems in which it is ok to try new strategies, acceptable to make mistakes and to fail, and provide an environment in which to compete with others in healthy ways while developing and practicing a myriad of social skills. Games encourage us to enjoy time spent together socially while also critical thinking and doing what our brains love to do best: solving problems. Games help boost a sense of efficacy and inspire esteem, in a game you CAN accomplish great things, and believing in yourself is the foundation for all future successes. Regardless of their inherent “educational value”, games provide all of these amazing benefits and more. Many games also involve opportunities to learn and practice reading skills, language, vocabulary development, math concepts, and spatial relationships… to name a few! Games also provide meaningful opportunities to hone essential life skills such as thinking ahead, strategic planning, resource management, positive social interactions, conflict resolution, and teamwork. Some games model basic economic principles such as supply and demand, while others encourage players to evaluate multiple possibilities and decide on the best course of action, while still others demonstrate probability in action. Learning is everywhere in our lives, and games offer a very specific type of experience that is innately educational in all of these ways, and likely more that I haven’t listed here. A basic concept of educational theory and pedagogy taught to teachers is that students learn best when they are engaged and interested in the material, and that a sound way to build engagement is to connect the material at hand to prior experiences or background knowledge. Effective teachers often build lesson plans that include “anticipatory sets”, activities designed to introduce students to concept and pique their curiosity, or review concepts previously learned. Effective teachers also find ways to connect the subject material in a personal way to the students, asking questions, invoking imagery, telling stories, and progressively building up ideas so that students understand not only the learning objective of the day, but the context in which it occurs. So, here’s where I think a good number of modern board games can REALLY shine… many “off the shelf” games designed with optimal play experience in mind (not learning objectives or content standards!) can be used to introduce broad concepts to students and set up a base of knowledge and experience that will help cultivate curiosity and create connections. By interacting with game pieces and cards representing historical elements, playing through systems that are designed to emulate some of the important events and relevant themes, and experiencing fun and engaging game play centered around a specific time period, teachers can use games as an activity to help create an optimal learning environment that will motivate students to learn the content. The game doesn’t need to “teach” the concepts, just introduce them in a fun way, provide some interesting mechanics that encourage thoughtful decision making, and create an experience the players will remember. This is a bit of a revolutionary idea, and it doesn’t necessarily integrate well into a typical classroom setting, however I think this is something worth exploring. Within the current educational climate, this idea could be implemented through parental interventions (play games with your kids! ), afterschool board game clubs, through individual or small group tutoring sessions to help struggling students, and in libraries and other community outlets to enhance learning. Additionally, if time and resources allow, many games could be played in small groups in the classroom, or modified for whole group play. Games can be used to introduce a lesson block topic or could have entire lessons built around the concepts presented in the game. The point is to make the learning fun for the students and to engage them by activating their curiosity about a topic and providing relevant “experience” that can’t be easily replicated in other ways. Forming connections with material is a key factor in retention and engagement, and playing games gives students a potential reason to care about a topic. Have you ever heard a student ramble off a giant list of stats and details about a game character they loved? Looking at ways we can use the power of games to interest students is an invaluable step in providing top notch engaging curriculum. Board games seem like an especially great avenue because they encourage social interaction and require the players to keep track of the game state information that is often hidden behind the scenes in video games, which can help provide a more solid understanding of the overall framework and enhance the learning capabilities. Here are a few general ideas of how existing games could be used in this way with a complex game called Through the Ages. 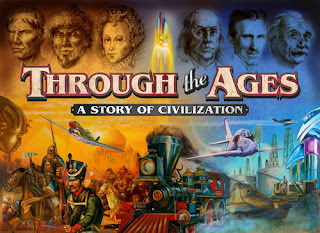 Through the Ages is an in-depth civilization building game by Eagle Games with a long play time that may make it challenging to use in a classroom, but it offers amazing potential to explore world history and provides a broad knowledge base upon which a teacher could build a vast array of lessons that connect back to the experience of playing the game. As an introduction to world history, this game has mechanics that represent the how development of new technologies influenced the capabilities for food and resource production. It provides a wide range of historical leaders which each have game play mechanics that help reinforce the philosophies and tactics they are best known for. It uses wonders to present historical monuments, and again reinforces the theme through mechanics. This game provides a broad reference and jumping off point for many historical explorations, and it’s amazing strategic depth and game system really reinforce the theme well and provide an opportunity to practice many of the skills discussed above as well as cover a broad base of world history. Playing through a game of Through the Ages can help provide an experienced base context for a wide array of lessons, and can inspire curiosity that will motivate students. “Who is Hammurabi?” “What is the Kremlin?” “Why does Genghis Khan give me a bonus to my horseman units?” On the flipside of that, playing a game that includes historical figures and places will provide something for a student to “latch” on to when they are learning about a topic. “Oh, Frederick Barbarossa? I remember him! He was my leader in that game we played and I got to turn my workers into military with him… that totally makes sense because he led his people into all those wars”. Educators can capitalize on this curiosity or reinforce these connections and make the experience richer and more educational. In addition to specific people and places, key concepts can be represented in a game in a way that allows students to experiment with these ideas and really get a grasp of how they work. For example, in Through the Ages technology advances such as the development of irrigation (then later selective breeding and mechanized agriculture) really affects the food production of a civilization, which influences the population level that can be sustained, the happiness of the people, and the ability to generate armies. These broad concepts can be emphasized by a teacher and used as a basis for lessons on how the availability of food has significantly impacted civilization growth, achievement, and conflict throughout history. With the experience of interacting within the environment of a concrete game mechanic, this concept can become much more tangible for students, and also far more interesting. I could go a lot deeper into the specifics of this game, or the multiple "teachable" moments this might present so over the next few months I am planning to develop some of these concepts into curriculum ideas and discuss some specific games that seem especially suited for this purpose here on the blog. Feel free to comment or send any ideas or comments my way. I’d love to hear what other people think, how games have worked (or not worked!) for you in educational settings, and recommendations for games that can be used to teach “right out of the box”. Hello! I noticed that we were neglecting pen-and-paper roleplaying for a while, so I decided that I would share a bit of custom content I made for my favorite roleplaying game, Pathfinder. The Pathfinder Roleplaying Game is the successor to Dungeons & Dragons version 3.5. One of the very first prestige classes in D&D 3rd Edition, the Arcane Archer has stood the test of time. It's an excellent concept: an elf fighting tradition that fuses arcane magic and archery. So what I have done is I took the Pathfinder version of the classes and modified it to combine divine magic and archery... why should the arcanists get all the love? I think that this is an overdue concept! I have reworked abilities to focus on combating enemies of the faith, including abilites primarily good against undead and outsiders. So... here it is! Enjoy! Elves or half-elves who seek to perfect the use of the bow in service to their deity sometimes pursue the path of the Sacred Arrow. Sacred Arrows are masters of ranged combat, as they possess the ability to strike at targets with unerring accuracy and can imbue their arrows with powerful spells. Arrows fired by Sacred Arrows smite the enemies of their faiths. At the height of their power, Sacred Arrows can also deliver the blessings of their deities via their arrows, as well. Those who have trained as both rangers and clerics excel as Sacred Arrows, although other multiclass combinations are not unheard of. Sacred Arrows may be found wherever elves travel, but not all are allies of the elves. Many, particularly half-elven Sacred Arrows, use elven traditions solely for their own gain, or worse, against the elves whose very traditions they adhere to. Role: Sacred Arrows deal death from afar, winnowing down opponents while their allies rush into hand-to-hand combat. With their capacity to unleash hails of arrows on the enemy, they represent the pinnacle of ranged combat. Alignment: Sacred Arrows can be of any alignment, though as elves and half-elves tend to be free-spirited, they are rarely lawful. Similarly, it is uncommon to find evil elves and half-elves, and the path of the Sacred Arrow is therefore more often pursued by good or neutral characters. To qualify to become a Sacred Arrow, a character must fulfill all the following criteria. Spells: Ability to cast 1st-level divine spells. The Sacred Arrow's class skills (and the key ability for each skill) are Knowledge (Religion), Knowledge (The Planes), Perception (Wis), Stealth (Dex), and Survival (Wis). All of the following are class features of the Sacred Arrow prestige class. Weapon and Armor Proficiency: A Sacred Arrow is proficient with all simple and martial weapons, light armor, medium armor, and shields. Spells per Day: At the indicated levels, a Sacred Arrow gains new spells per day as if he had also gained a level in an divine spellcasting class he belonged to before adding the prestige class. He does not, however, gain other benefits a character of that class would have gained, except for additional spells per day, spells known (if he is a spontaneous spellcaster), and an increased effective level of spellcasting. If a character had more than one divine spellcasting class before becoming a Sacred Arrow, he must decide to which class he adds the new level for purposes of determining spells per day. Enhance Arrows (Su): At 1st level, every nonmagical arrow a Sacred Arrow nocks and lets fly becomes magical, gaining a +1 enhancement bonus. Unlike magic weapons created by normal means, the archer need not spend gold pieces to accomplish this task. However, an archer's magic arrows only function for him. In addition, the Sacred Arrow's arrows gain a number of additional qualities as he gains additional levels. The elemental, elemental burst, and aligned qualities can be changed once per day, when the Sacred Arrow prays for spells. At 5th level, every nonmagical arrow fired by a Sacred Arrow gains the distance weapon quality. At 7th level, every nonmagical arrow fired by a Sacred Arrow may gain one of the following elemental burst weapon qualities: flaming burst, icy burst, or shocking burst instead of one of the qualities in the Enhance Arrows (Righteousness and Retribution). At 9th level, every nonmagical arrow fired by a Sacred Arrow gains one of the following aligned weapon qualities: anarchic, axiomatic, holy, or unholy. The Sacred Arrow cannot choose an ability that is the opposite of his alignment, or the alignment of his patron deity (for example, a lawful good Sacred Arrow could not choose anarchic or unholy as his weapon quality). Align Arrow (Sp): Starting at 2nd level, every nonmagical arrow fired by a Sacred Arrow is aligned, as per the spell Align Weapon. For the purpose of overcoming damage reduction, the arrow is treated as Good/Evil/Lawful/Chaotic (only one). The Sacred Arrow may not choose an alignment opposite his own, or of his patron deity. Therefore, a Lawful Neutral Sacred Arrow of a Lawful Good deity could not choose Evil, for instance. Seeker Arrow (Sp): At 4th level, a Sacred Arrow can launch an arrow at a target known to him within range, and the arrow travels to the target, even around corners. Only an unavoidable obstacle or the limit of the arrow's range prevents the arrow's flight. This ability negates cover and concealment modifiers, but otherwise the attack is rolled normally. Using this ability is a standard action (and shooting the arrow is part of the action). A Sacred Arrow can use this ability once per day at 4th level, and one additional time per day for every two levels beyond 4th, to a maximum of four times per day at 10th level. Disruption Arrow (Sp): At 6th level, a Sacred Arrow can launch an arrow once per day at an undead target, granting it the disruption quality, except that the Save DC is 10 + half the Sacred Arrow’s class level + the Sacred Arrows Wisdom modifier. Using this ability is a standard action (and shooting the arrow is part of the action). A Sacred Arrow can use this ability once per day at 6th level, and one additional time per day for every two levels beyond 6th, to a maximum of three times per day at 10th level. Hail of Arrows (Sp): In lieu of his regular attacks, once per day a Sacred Arrow of 8th level or higher can fire an arrow at each and every target within range, to a maximum of one target for every Sacred Arrow level she has earned. Each attack uses the archer's primary attack bonus, and each enemy may only be targeted by a single arrow. Arrow of Life (Sp): At 10th level, once per day the Sacred Arrow may fire an arrow at a target as a touch attack. If it hits, the arrow itself does no damage but instead acts as a Heal spell cast at the Sacred Arrow’s effective caster level. As with a normal Heal spell, this may be used as a Harm spell against undead. So... I hope you liked it! This is one example of how you can tweak existing content to give you new and interesting options. This could be a great advancement option for a Cleric or Inquisitor focused on archery, or perhaps a Paladin with the new Divine Hunter archetype from Ultimate Combat. Lots of possibilities! Event Report: Train-y Day at Rainy Day! Hello, everyone! The Growing Up Gamers crew is excited to bring you our first event report! Randy & Angie went to Rainy Day Games in Aloha, Oregon (near Portland) for the release of the Railways of the World Card Game expansion on July 31st. Let's start by talking about Rainy Day Games. If you are a gamer and you live in Oregon, you need to check this place out if you somehow have not already. I am being very serious here. Their staff is friendly, and every one is a gamer who knows their stuff and can make great recommendations. It is always well-stocked and clean, too. Angie and I have gotten to a point where it is starting to get hard to find game stores that have more games than we do, but we never lack for something new to check out when we go there. So when they invited us to attend this event, we immediately slapped it on the calendar and made a plan. We recently discussed the Railways of the World Card Game in this post; if you have read that, you'll know that we love the game. I'm not going to rehash everything about that, but I do want to emphasize that it is a very strategic and fun game that delivers the experience of a train game in cardgame form. It was designed by Steve Ellis and James Eastham, who also designed the expansions for the standard version of Railways of the World (which we were inspired to pick up... possibly a review of this soon!). They were on hand to get things started and let us know what the expansion did for the game. The primary new things the expansion adds are tunnels, switches, grey cities and railway barons. Tunnels allow you to create a link from one city on the board to any other with the same color link. The switches allow you to make a link with cards to two different colors, useful for laying down high-cost cities or making a high-point link. Grey cities are cities that do not allow goods to be delivered to them, allowing for longer deliveries. The rail barons all give an endgame goal that can get you extra points. Another optional extra introduced in the expansion is an alternate draw method, which makes things less random. Instead of one draw pile that combines links, there are three draw piles and face up daw options. Links in one pile (three face up, draw up to two), cities in another (two face up, may draw only one) and locomotives in the last (may only draw one). The draw method makes the planning of your turns and links a little more strategic, and players can map out their routes more carefully. This expansion really raises the stakes for the Railways of the World Card Game. Players familiar with the game can expect higher scores, and possibly bigger point spreads at the end. I like all the additions, but my favorite are the rail barons. I like having a goal to work toward and be able to cash in for points at the end. If you have played Race for the Galaxy, these kind of work like the six point developments in that game. We played with the method where each player is dealt two barons and gets to choose one to kepp, which we really enjoyed, but there is another way to play in which several barons are face up on the table and as an action a player may select one to take. This looks like another great way to use the baron cards, and we'll definately be trying this next time.The tunnels are great, too. Each player may make only one, but this can be a great setup for a long end-of-game delivery. Like I said, expect higher point games! This expansion has a whole variety of fun new things to add to the base game, and you can totally mix and match them as you like for a customized play experience and to mix up your game. We really enjoy what the expansion has to offer, and if you like the game you will definately want to pick this up! ﻿ ﻿The great thing about gaming events is getting to play with new people. We were introduced to Jason and Joan, who had each already played the game and who had come to try out the expansions, as well. We had a great time playing with them, and they both gave a us a run for our money. We played the with the base set, the expansion and the optional draw method. Everybody made great use of their tunnels, and loads of goods were delivered. The actual scores I don't remember, but Angie took first place and I took third. A relatively narrow point spread told us that it was anybody's game up to the very end, and we all felt like we had been pretty evenly matched. I'd like to add that on top of being great opponents, they both had heard of our blog! We were pretty stoked to have people recognize us and tell us they liked our blog. Randy's in trouble! Angie caught him checking out Cleopatra's Caboose! ﻿﻿ We had a great time. If you find yourself in the Portland/Beaverton area, and you have the opportunity to pop by Rainy Day Games, please do; you won't be sorry. I have never seen a store with the selection they do. And also, as soon as I can transcribe it (I type glacially slow) we will be posting an interview with the designers of this game (our first interview!). Stay tuned!